Grocery shopping and cooking your own food while traveling is a great way to save money and stick to a budget. Over the course of our RTW trip we will be staying at a number of guesthouses and hostels that will include a kitchen and other cooking utensils, so we will be taking advantage of these when possible. While we still plan on enjoying the delicious local cuisines of countries we visit, purchasing food and cooking meals ourselves will benefit our budget and health. After spending our first few nights in a Tokyo hotel and eating out every single meal, we were looking forward to getting to our Kyoto guesthouse. It has a communal living area with a full kitchen and everything we need to make some meals over the seven nights we will be staying. 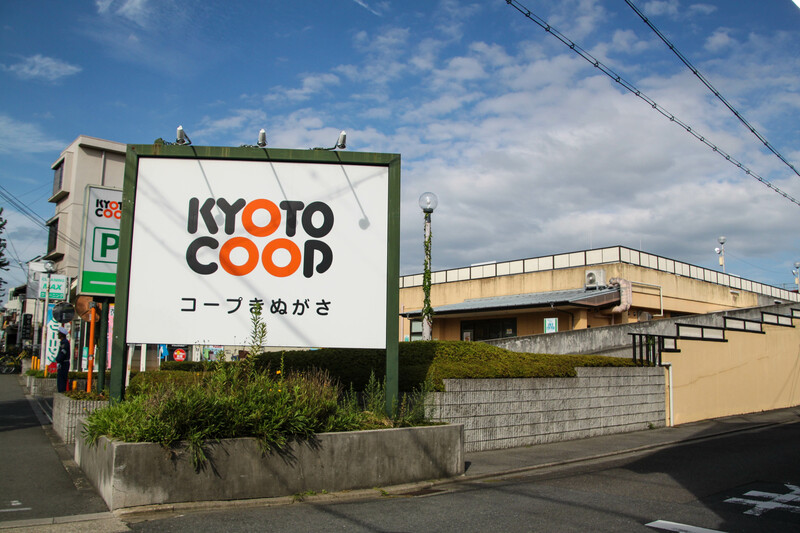 And lucky for us, the Kyoto Co-op is just down the street from our place. 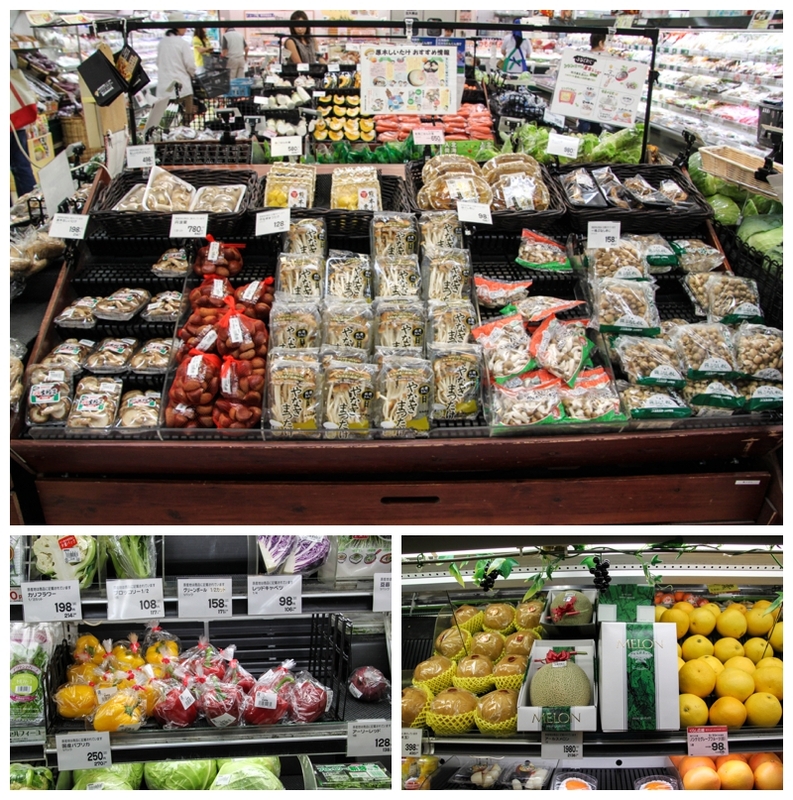 We found the produce offering similar to shopping in the U.S. However, the mushroom selection was huge. We can not read any of the packaging but it appears you would be able to find any type of mushroom you want. And, we noticed they love to package everything, much like Trader Joe’s back home. While most of the prices are similar to what you would find in the U.S. this time of year, the melon price jumped out to us. It’s clear there is something special about this melon but we can not figure out what, all we know is the price is about $17 USD! 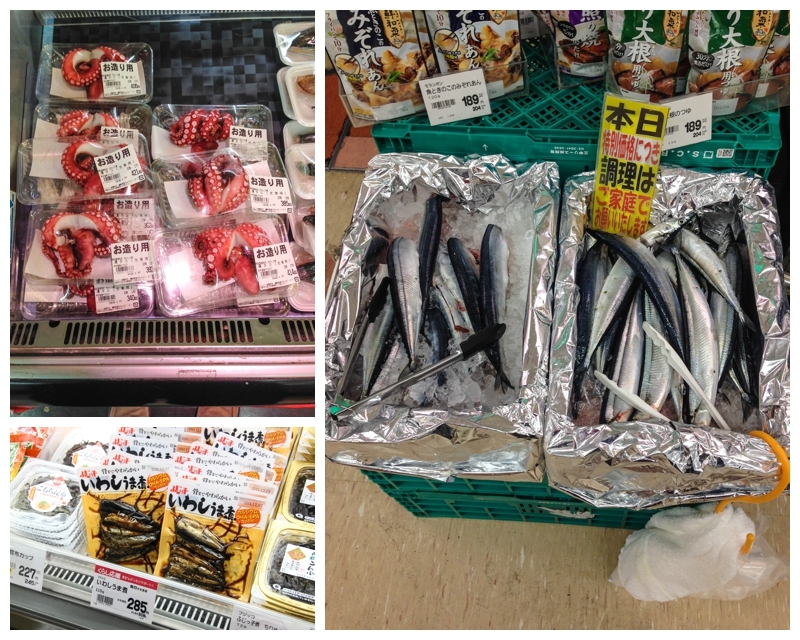 Both grocery and convenience stores (like 7/11) in Japan offer a large selection of prepared meals. The complete sushi meals (top left) cost about $4.50 USD and the sashimi (top right) cost about $3 USD and the quality is much better than what you would find at a grocery store in the U.S. We also found plenty of hot food offerings, including fried fish/pork/chicken, satay skewers and these fried vegetable things (middle of bottom right) that are similar to giant onion rings but also have carrot and zucchini mixed in. These all cost anywhere from $.75-1.25/piece. 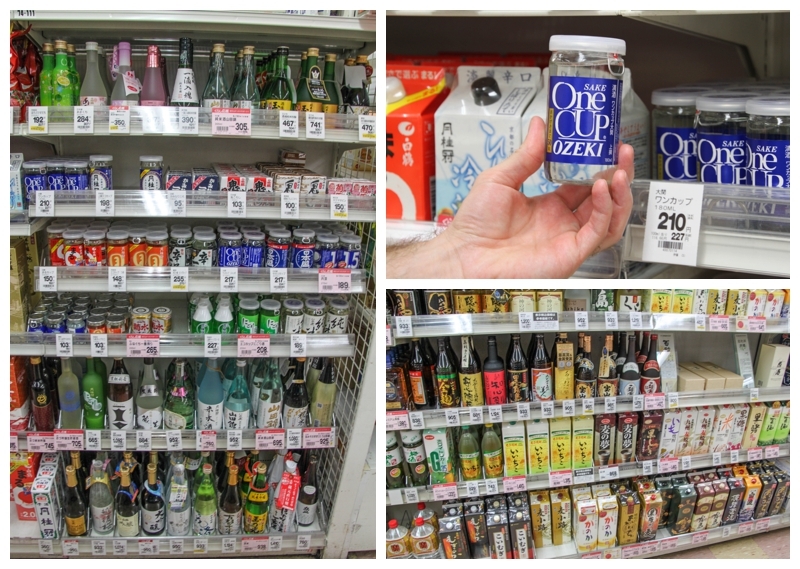 You can find beer, wine, liquor and sake in grocery stores. Compared to what you might find in a U.S. grocery store, it is a much smaller selection. However, there are liquor stores that have expansive selections of everything you can imagine if you are in search of something specific. Let’s talk about beer, which we both enjoy. It is expensive. A single can will cost you between $3-6 USD. A case of our favorite Japanese beer, Asahi Super-Dry was available for about $40 USD! I guess we won’t be complaining about beer prices once we get back to the U.S. Since Matt loves his chips and salsa, he was hoping to find some tortillas and local salsa…no such luck. However, he did find some interesting flavored chips, pretzels and other snack type items. There were a number of shrimp, soy sauce, ginger, vegetable and meat flavors to choose from. We did try the soy sauce potato chips, which were not bad, but Matt will continue his search for chips and salsa in South Korea. The dessert items are something to see, Japan is SERIOUS about their flavors! 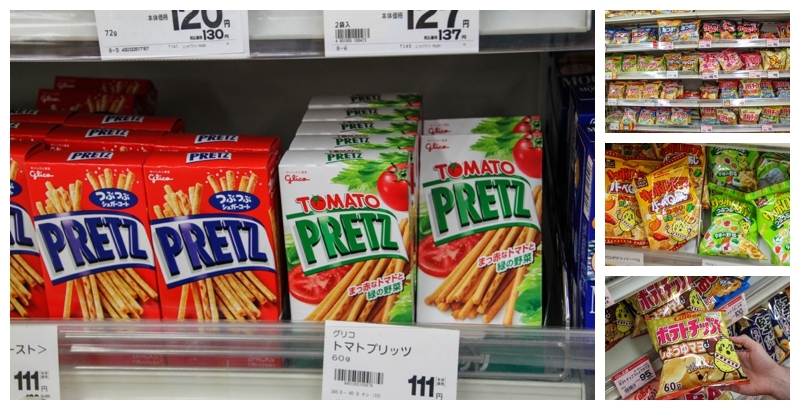 Similar to the snack aisle, you can find some very interesting flavor combinations. Kit Kat bars stick out immediately, most notably the green tea option, which we will be trying before we leave. We didn’t get too crazy here, as Alana went for dark chocolate and peanuts. Maybe next time. The Co-op did not disappoint with their selection of soy sauce. 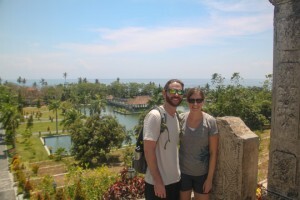 We saw several varieties, including regular, spicy and even a sweet jelly-like soy sauce. Plus, if you don’t get enough sodium from your soy sauce, they offer an entire end-cap of salts! Checking out can be a fun exercise too. This particular store wants you to shop with a grey basket and once you pay for your items the clerk transfers them into a red basket. We did not catch-on to this until our third trip, as we kept picking up a red basket on our way inside instead of grey. We got a few strange looks, but my guess is they get this from most people who can’t ready the Japanese signs. Oops! What’s the craziest thing you’ve seen grocery shopping abroad? Be sure to read about our favorites places in Kyoto! I’ve tried the green tea kit kats! Super good! Very light green tea flavor – tastes a lot more white chocolate than anything else. Hey Jas! Yeah, I agree the green tea kit kats have a very delicate green tea taste. Unfortunately, they were sold out at the store tonight so Matt might not be trying them after all. No worries though, we made up for it with green tea ice cream-yum! Oh, the other thing we learned was that when in the produce section and basically anywhere where you have to get something weighed there is a person there that will weigh and tag your bag before you go to the checkout. Unlike the states where you can get it all weighed at the checkout. so be on the look out for that. May just be a China thing. My favorite part of taking photos in grocery stores is the way people avoid you, but when the camera is put away we always get that one guy that creeps up on you until he can see into your cart and then runs away.